More than a million children gathered over the weekend to march, demanding safer schools and gun reform. They also vowed that the protest doesn't end with the march. Their next target is the ballot. 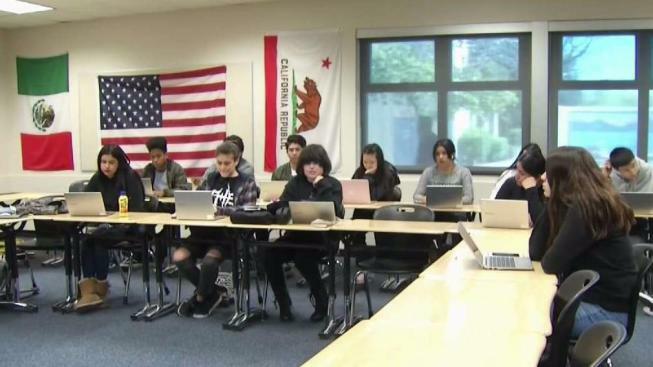 In a government class at Overfelt High School in San Jose, many students already are registering to vote, even though they’re not of age yet. Teacher Jared Washington’s class is always engaged, but lately, one topic has dominated the conversation: the electoral process and the importance of voting. "I just tell them the need to vote, whether they’re 18 now, going to be 18," Washington said. "Voting is a way to change things." For the past year and a half, California has been preregistering teenagers to vote so they'll already be on the books once they turn 18. Since the Parkland, Florida, high school shooting that killed 17 people and the student-led demand for reform, California Secretary of State Alex Padilla says those preregistration numbers have spiked. His office is now seeing as many as 3,000 teens preregistering to vote every week. Jennifer Vasquez is one of those teens. "It's very important you make an informed vote, even in local elections," she said. One of her classmate thinks otherwise. "I find my decision not to vote, my decision," Overfelt student Denix Evans said. "I don’t think people should be forced into voting." Evans, however, is realizing she might be the exception, as many of her peers across the nation are signing up, potentially creating a significant and powerful voting bloc. California has 96,000 teenagers preregistered to vote, a significant jump since the deadly Florida shooting. Teens can preregister online with the secretary of state's office.